Denise has lived locally almost all her life and has been married to Bruce for 37 years. Denise and Bruce have 3 married daughters and 5 grandchildren. Denise's full time career was in education, teaching children with emotional and behavioural difficulties at a special school in Sefton. In 2007 Denise retired from St. Francis of Assisi Academy in Liverpool, where she was School Chaplain: it was the first Anglican and Roman Catholic Academy in the country. Alongside her teaching, Denise trained on the Northern Ordination Course and was ordained at Liverpool Cathedral in 2003. She served as a curate at Christ Church, Waterloo until 2009 before taking up her NSM position in the United Benefice. Born in Ormskirk, Fr Dennis moved to the family house in Waterloo where he has lived since 1954. He was a pupil at the Crosby Road Infant, Primary and Secondary Schools before transferring to Merchant Taylors’ to study for A levels. Following three years at the University of Lancaster, he spent a year completing a post-graduate teaching certificate at Christ’s College, Woolton. Between 1974 and 1977, he studied on the Manchester-based Ordination Course, was made Deacon in 1977 and ordained Priest the following year. Having taught for seven years at Manor High School in Crosby, in 1979 he returned to Merchant Taylors’, where for the next thirty one years he taught Religious Studies and occupied the roles of Chaplain, Master in charge of Cricket, Form Tutor, House master and President of the Joint Schools’ Debating Society. Dennis joined St. Faith’s as a wolf cub and Sunday School member at the age of ten and has been an honorary assistant priest for the last forty years. Dennis has a keen interest in books and films and much enjoys visiting tea shops, pubs, restaurants and garden centres. 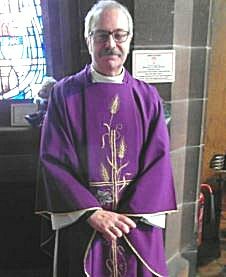 Bill Matthews was baptised and confirmed in the Church of England parish where his brother serves as churchwarden. During his early teens Bill was drawn to atheism. However, the Independent Methodists helped him encourage and develop his renewed faith. Their training led to self-supporting ministry. A strong sense of call to the Royal Navy demanded a transfer to the Methodist Church. Bill was a Methodist Circuit minister in London and, after ten years in the RN, led a number of churches in Portsmouth along whilst being a chaplain and lecturer in the university. This was a natural outlet for Bill's passion for and experience in Business and Education. Fred is Reader Emeritus at St. Mary's and St. Faith's, and a retired physician. He and his wife Linda live in Crosby and are active members of the Waterloo Partnership, a local charity linking with the community of Waterloo, Sierra Leone and which is actively supported at St Faith's. Fred is also a keen amateur astronomer. Paula was born in Liverpool in 1972 and grew up locally, attending Sacred Heart High School in Crosby. She studied English and History at the University of Aberdeen, then worked at a care home in Aberdeen before returning to Merseyside in 1998 and working as a manager in care homes in Liverpool. In 2002 she joined the civil service in Bootle, where she works as a Chartered Internal Auditor. Brought up as a Roman Catholic, she recognised a few years ago in her heart that she was an Anglican. She was formally welcomed into the Church of England at St Faith's by the Bishop of Warrington in 2009. She followed a call to Reader Ministry, undertaking 3 years’ training and was licensed by the Bishop of Liverpool to the United Benefice in September 2012. She has a wide range of interests, taking up ballet in 2000 and having passed two exams with the Royal Academy of Dance. She likes to keep fit at the gym, goes to the theatre, stand-up comedy clubs and classical music concerts. She follows cricket and current affairs and has a love of history. She is learning German and hopes to take up Russian in the not too distant future.